A new marijuana poll has the highest support yet for legalization -- and expungement -- a key House GOP chair blocks another reform measure, Canada's marijuana legalization will go into effect October 17, and more. New Poll Has Highest Support Yet for Marijuana Legalization. 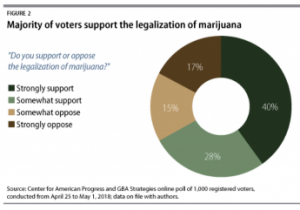 A poll released Wednesday by the Center for American Progress and the research firm GBA Strategies finds that 68% of Americans now support marijuana legalization. Forty percent "strongly" support while 28% "somewhat" support it. Only 32% of respondents were opposed, 17% of them "strongly." The poll also found strong support for expunging the records of past marijuana convictions, with 70% saying states should "automatically seal the records of individuals convicted of nonviolent felonies or misdemeanors if the person has completed his or her sentence and has not committed another criminal offense." New York Activists Challenge De Blasio's Marijuana Arrest Moves. Advocates, community organizations, and Council Members held a press conference and rally Wednesday challenging Mayor de Blasio and the NYPD's newly-announced marijuana enforcement policy, urging the Mayor to end racially biased marijuana arrests completely. The mayor and NYPD Commissioner announced the policy shift Monday in the culmination of their 30-day review period to assess marijuana enforcement in NYC. Due to exclusions in the Mayor's new policy, advocates raised concerns that racial disparities in marijuana arrests could continue -- and perhaps increase. They stood strongly opposed to marijuana continuing to be used as a pretext for unnecessary NYPD interactions with community members. House Republican Leadership Blocks Resolution Apologizing for War on Drugs. A congressional resolution apologizing "to the individuals and communities harmed by the war on drugs" has been blocked from getting a floor vote by perpetual obstacle to reform House Rules Committee Chairman Pete Sessions (R-TX). In a Rules Committee action Tuesday night, the committee failed to approve the bill for action. Canada Marijuana Legalization Goes Into Effect October 17. Prime Minister Justin Trudeau has announced that marijuana legalization will go into effect on October 17. The delay will allow provinces time to set up retail sales schemes, he said. "It is our hope as of October 17 there will be a smooth operation of retail cannabis outlets operated by the provinces with an online mail delivery system operated by the provinces that will ensure that this happens in an orderly fashion," he told reporters. Amnesty International Accuses Russia of "Repressive Act of Censorship" for Huge Fine Against Media Outlet for Interview Where Drug Legalization Was Discussed. The Russian government's media regulator has fined the online magazine 7x7 the equivalent of $13,000 for broadcasting an interview with a politician who expressed support for drug legalization. "The extortionate fine imposed on 7x7 is ridiculous," Marie Struthers, Amnesty International's Director for Eastern Europe and Central Asia, said. "This is an act of censorship and a blatant violation of freedom of expression that must be reversed immediately." 7x7 was prosecuted under the country's law against "propaganda for narcotics offenses." "The Russian authorities seem to believe that they can address topical societal issues by shutting down any public debate about them -- on this occasion, by using draconian laws to persecute an independent media outlet," Struthers continued. "The government has already banned public discussion of various topics, such as LGBTI rights, and has labeled peaceful political dissent as 'extremism'. The fine against 7x7 is, without doubt, a message to all Russian media that there will be severe consequences for discussing subjects of public interest that are uncomfortable for the government."